Home » NHCC » 2018 Belmont “Jeri Blair” Invite Recap and Results! The weather was perfect for the 37th Jeri Blair Invitational in Belmont, NH. With eighteen teams competing with the majority of those being from Division 3, the meet shapes up as sort of glimpse into what is possible for the D3 championships. Four of the top boys teams in D3 and three of the top girls teams were on hand to take measure of where they’ve gotten to at this point of the season. Add in Hollis Brookline, Sanborn, John Stark and the meet takes on the feel of the D3 championships. Things got underway at 4pm with the girls race. Belmont’s Alice Riley took no time at all to pull to the front, trying to get the drop on defending D3 champ Mya Dube of Kearsarge and the rest of the field. But by 800 meters, Dube had pulled even and the two ran shoulder to shoulder out of the field complex and into the backwoods. 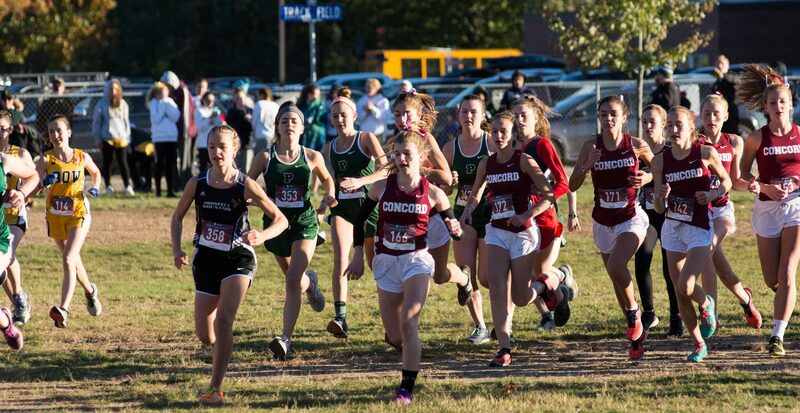 Sanborn’s Avery Scully, Hopkinton’s Emma Rothe and Cailey Stockwell, Gilford’s Cat Stow, Winnsquam’s Faith Gosselin, White Mountainn’s Leah Dutkewych and HB’s Amy Pattelena and Kay Partridge were leading the chase pace 30 meters back. 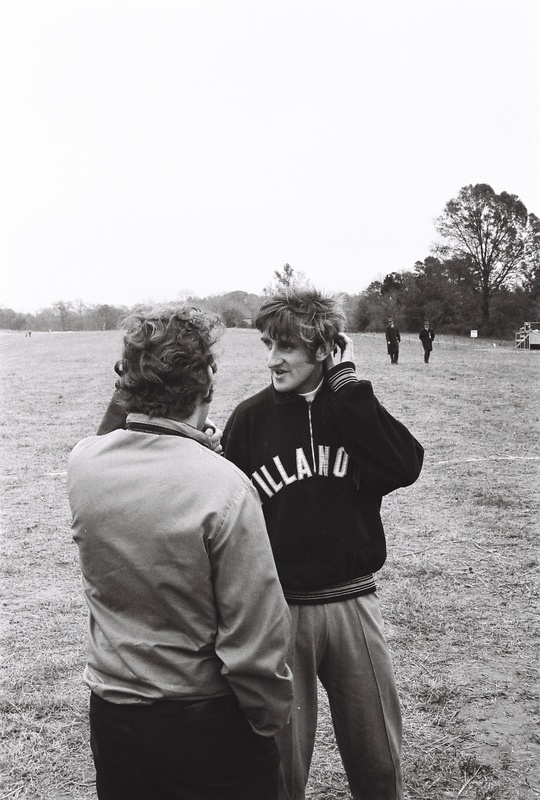 With Belmont’s two loop course the racers emerge from the back hills approximately 1 and a quarter miles into the race and when the leader emerged, Dube was alone in front, opening a 100 meter lead by the halfway. Scully and Riley were now running side by side with a 100 meter gap back to the chase pack. By now things were stringing out as the big hill just before halfway beginning to cost those who gambled too hard at the beginning. Mascenic’s Quinn Aldrich was moving up through the pack and was now threatening the top ten. By the time Dube emerged from the backwoods for the second time, she had built up an even bigger lead, going on for the win in a sub-20 clocking of 19:26.6 on the 5142 meter course. Scully was leading as she and Riley stepped onto the track for the 350 meter finish, but Riley fought to another gear, finishing second to Scully’s third. Rothe and Stow would make up the rest of the top five. They were followed up by Dutkewych, Gosselin, Aldrich, Stockwell and Pattenelata to round out the top ten. Hopkinton would go onto win this one, with their top five in the top 22, with 57 points. Hollis-Brookline would take second, ten points ahead of John Stark, 81 to 91. Mascenic would be the next D3 team in with 121 points, five points in front of fifth place Kearsarge. The boy’s race had twice as many entrants as the girls emphasizing the need to get a good start before the tight single track 600 meters later, so this one got off quickly. A very solid front pack of Sanborn’s Dylan Khalil and Owen Stocker, HB’s Kenny Corsetti, John Stark’s Brandon Langdon, Mascenic’s Landen Vaillancourt and Logan Thibault, Winnisquam’s Kyle Mann, Trinity’s Danny Donovan, Alex Cermak and James Barrett were trying to sort things out before the woods followed by a strong chase pack loaded with D3 contenders from Kearsarge, Trinity, Mascenic and Winnisquam. By the 800 meter mark Vaillancourt and Khalil had established themselves at the front as they headed away from the athletic fields and out into the backwoods. When they emerged, Vaillancourt was leading Khalil by a step, Khalil willing to let Vaillancourt set the pace for the second half. By this point it was becoming obvious four of the D3 teams were keying off each other, testing the waters for what’s to come at the D3 Championships in just over three weeks. The Mascenic boys were slowly pulling the trigger while Kearsarge was whittling their way up through the pack and Trinity and Winnisquam were holding onto the early positions they had established. Many of these team members were chasing uniforms and defending the positions they had established with these teams holding twenty of the top thirty places in the race. With Khalil and Vaillancourt still together heading back into the woods, the battle raged on behind them. As the leaders returned to view, Vaillancourt seemed poised for his first big win, taking the advantage on the last hill and headed down onto the track. Khalil then made his bid for glory once he was on the track, opening a 7 meter gap with 150 meters to go. But Vaillancourt held a little in reserve and was able to pull by before the finish! Both racers were credited with a 17:06 performance. Defending champ Corsetti would finish in third, 32 seconds back. Thibault and Langdon would round out the top five. Rounding out the top ten would be Donovan, Mascenic’s Dakota Somero, Barrett, Mann and Stocker. The Mascenic team would dominate over the second half of the race, putting their top six in the top nineteen, winning by 38 points over Trinity, 43 to 81. Kearsarge would also run a great second half of the race, finishing with 98 points. Winnisquam and Sanborn would round out the top five. Mascenic Team Blogs Weeks 8+9! Previous post 15th Battle of the Border Preview!